Late spring signals the arrival of special spring visitors — those flighty little jewels called hummingbirds. If you haven’t put your hummingbird feeder out yet, you may want to do it in the next few days, because those gorgeous birds will soon look for food and nesting sites. 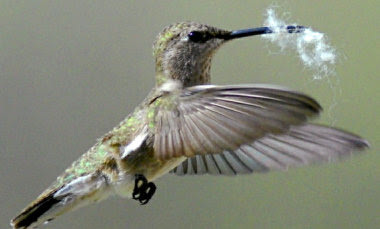 Hummingbird experts recommend this recipe for your feeder: Use one part white cane sugar to four parts water. Some say boil the water, some say don’t boil the water, so take your pick. Never use honey or artificial coloring, and store unused portions of your recipe in the refrigerator. In addition to a feeder or two (a second one is needed if you have male hummingbirds engaging in territorial battles), fill your yard with plants that entice them. Although red flowers are supposed to attract them best, hummingbirds are enticed to many other colors, including blue, yellow and purple. Hummingbird flowers often have long tubes for their long bills and tongues. Hummingbirds like to be around people and have no trouble flying close to where you sit, so put feeders and flowers close to where you can sit and enjoy them. Their nests, on the other hand, are not easily seen, because they are so small and in out-of-the-way places like a small tree branch 10 to 20 feet tall. Shaped like an open cup, the nest of a ruby-throated hummingbird is fashioned from thistle and dandelion down, all secured with spider web and covered with lichens on the outside. If you like to put out dryer lint, twine and other soft material for songbirds to use as nesting material, you may want to try the new Hummer Helper ready-made nesting material. One member of The Hummingbird Society testing it found 15 active hummingbirds nests within 100 feet of the bright-red wire frame holding the soft, fluffy stuff. You’ll find Hummer Helper and similar nesting products at local birding stores and online at sites such as http://www.songbirdessentials.com/.